Chile Pequin Jelly from chile pequins ( Capsicum annuum glabrisculum , bird peppers, turkey pepper, or chile de monte. In Texas if you want a genuine hot sauce or pico de gallo you definitely are wanting to use chile pequin in that sauce. 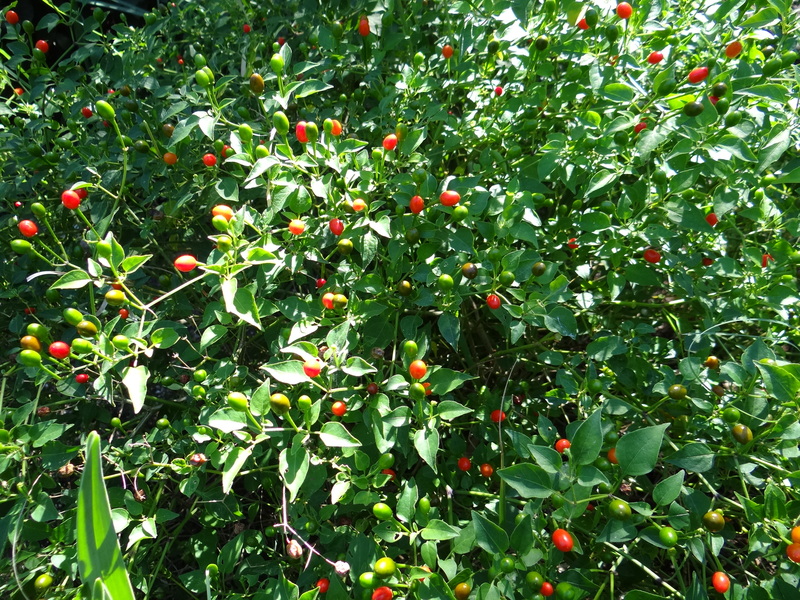 Chile pequin is a super hot chile with red and green fruit that grows wild nearly everywhere in Texas and parts of Mexico. The plant can grow several feet high and equally wide. The mocking birds are quite fond of the fruit so they thoughtfully deposit the seeds in forests, fields, backyards, and along fence lines where they happily grow year after year without the help of mankind to water or fertilize them. Should you want them in a spot where the birds haven’t planted them then you only need to gather some chiles and (with your surgical gloves on) squish the seeds on a paper towel. Let the seeds and pulp dry then plant the seeds in a pot or flat. Before you know it you will have numerous chile pequin plants. I have been considering making jelly from the chile pequin ever since I conceived the idea of writing this blog. However I was nervous that no one would want a hot jelly. After I was persuaded to make Serrano Jelly I realized that a sweet hot jelly was enjoyed by many people. I decided to give the Chile Pequin Jelly a chance. This year has been a perfect year for Chile Pequin fruit. The plant has been full of fruit almost all summer. I pick my bushes of all red fruit and within several days the plant is again loaded with fruit. You can also use the unripe green fruit if you would rather. I could find no recipes telling me how much fruit to use so I kept picking the berries and storing them in the freezer. I finally decided that I must certainly have enough fruit. I knew that I was not going to need the usual 8 cups of fruit. After mashing the fruit with the tears running down my face and coughing continually I decided that I would use just two tablespoons of the red berries. 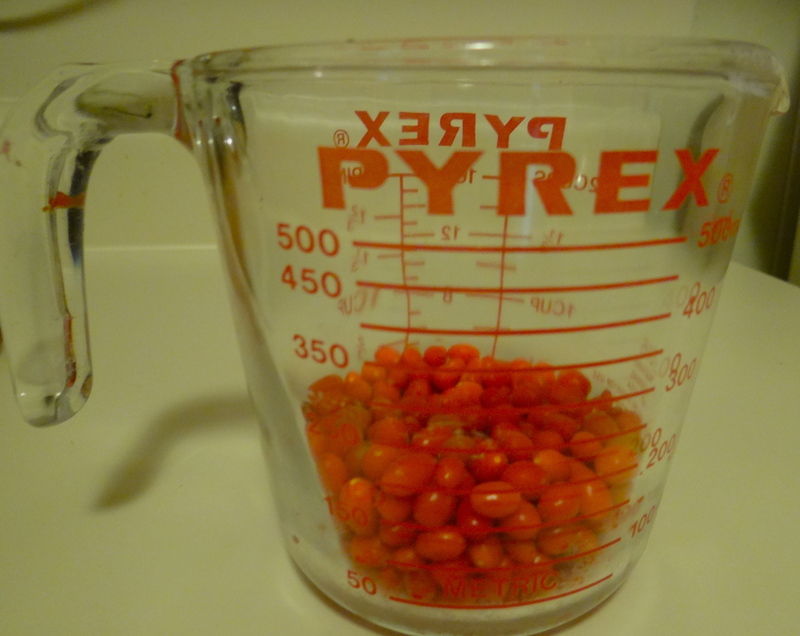 Some people might prefer to use only 1 tablespoon of the chile pequin. I used vinegar in my Serrano Jelly but I decided to use mostly fruit juice in this batch. I started by thawing out pyracantha and loquat juice from the freezer. I could have chosen any of the juices that are frozen in my freezer but chose those two because they do not have a strong color. I wanted to end up with a red color. I blended up a cup of the chiles in my food processor. I immediately started to cough and tears flowed freely from my eyes. I decided right then and there that one cup or even half a cup of chile pequin would be too much. I stored the chopped berries in a glass airtight jar to be able to continue working on this jelly. I then poured the juices into my pot. I really liked the pyracantha juice for this project because it had little color. The loquat had a slightly darker color but I didn’t have enough of pyracantha juice to make it entirely from that. I could have gone out and picked pyracantha berries since they are everywhere again this year and stay on the bushes for much of the winter. But since I have so much juice stored in the freezer I decided to blend the two juices. I then added lemon juice and sugar to the juices. After I brought the juices to a boil I added 2 tablespoons of chile pequin to the pot. I let the mixture boil for 15 minutes. I tasted the mixture. In doing so I realized that I needed to remove the seeds since it was so hot. Even in making serrano jelly I removed the seeds to keep if from becoming too hot of jelly. I ran the entire mix through a sieve. I then put 1/4 a teaspoon of the seeds back into the pot. The No sugar needed pectin that I like was added to the mixture. I then let the entire batch boil for a minute and one half. I find that since I freeze all my jellies it is better to add extra pectin because freezing tends to make the jelly not as stiff as I like. Additionally the no sugar needed pectin tends to create a more runny jelly. 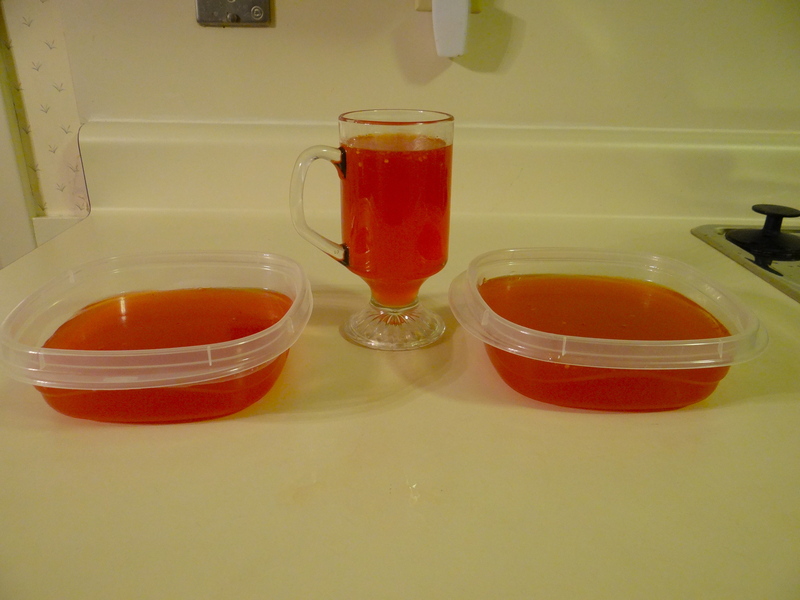 I then let the spicy hot jelly cool slightly before pouring it into freezer containers. After the jelly became stiff I tasted it without any cracker or other item. It is one incredibly spicy hot jelly. My lips still burned even after an hour has passed since tasting it. However, the heat of the jelly is controlled when placed on a cracker. It not only is hot and sweet yet the fruity flavors of the juices come though. Everyone brave enough to eat it has been very pleased by the contrast between sweet and heat, similar to the reaction to serrano jelly. At first one does not even notice the heat but is able to taste the flavor of the fruit. Then you will have an aftertaste low in the throat that reminds you that you just ate a hot pepper. My only suggestion would be to add a cup of vinegar to the recipe to make it jell better. If you do that then subtract a cup of juice. Do not forget to remove the chile seeds from the juice with a sieve otherwise no one would be able to eat the jelly since much of the heat is in the seeds. Many people enjoy eating spicy jellies with cream cheese and crackers. For the uninitiated to spicy hot foods you may want additional crackers and water on hand in case it is too hot for them to handle. This entry was posted in Recipes and tagged chile pequin, chile pequin jelly, hot jelly, hot pepper jelly, lemon juice, loquat jelly, loquat juice, original chile pequin jelly recipe, pepper jelly, pyracantha jelly, pyracantha juice, spicy hot chile jelly, spicy hot fuit jelly, spicy jelly, sweet and hot jelly, unusual jellies, unusual jelly. Bookmark the permalink. My mouth (and eyes) watered while reading your post. This really sounds great. Since I live in the Southeast, I may have to use a few different berries and chilies but will definitely make this Hot Pepper Jelly. Recycled Mom- It surprises everyone how good the hot jellies are. Be sure to look at the serrano pepper jelly recipe. It probably will work better for the peppers in your area. I have been making this type of jelly for over six years now and never get tired of making it and all my friends and family love it. I use sweet bell peppers of all colors when I make my jelly which is a lot less costly in the long run because the peppers are not that expensive and I only buy them when they are on sale. I only use about 1/4 tsp of peppers in my jelly and I use the entire pepper including the seeds. I have around 8 plants in my backyard that produce my chili pequin peppers. When the peppers turn red I pick them and then dry them and store them in large glass jars so when I need to make jelly all I have to do is measure out what I need and ground them up when I need to make any type of dish or jelly I decide to make. Marilyn-I enjoyed reading your comment. I like the idea of using ground dried chili pequin and then adding it to the sweet bell peppers of all colors. I really have to try your idea. Thanks for sharing.